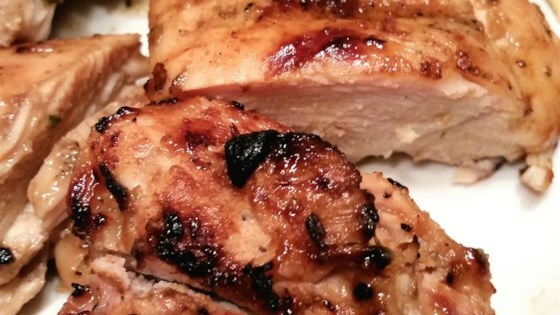 "Tangy, moist citrus chicken for the grill! Goes great with grilled potatoes and coleslaw." Mix canola oil, lemon zest, lemon juice, Dijon mustard, honey, garlic, Worcestershire sauce, Italian herb seasoning, salt, and black pepper in a bowl; pour into a resealable plastic bag. Place chicken breasts into the bag, seal, and squeeze bag with your fingers several times to coat chicken with marinade. Place a second resealable bag over the first and seal to prevent leaks. Refrigerate chicken for 2 to 4 hours. Remove chicken breasts from bag; discard used marinade. Cook chicken on the preheated grill until the center is no longer pink and the juices run clear, 7 to 8 minutes per side. This was just OK to us. Flavors were fine, but very subtle. Probably won't use this again. Very nice. I followed the recipe exactly, except I baked the chicken in the sauce instead of grilling it. Everyone loved it! Delicious! I used olive oil instead of canola. Also baked it in the oven at 425 for 20 minutes. Wonderful lemon flavor and very moist. Family of 6 LOVED it. They even fought over the last piece. NOTE: I peeled one lemon and slivered the peel. Added to the marinade, it was a powerful punch of lemon. YUM!